In the UK it is estimated that almost one in ten workers employed in manufacturing industries and in agriculture, forestry and fishing will go to hospital in the course of the year as a result of a work-related accident. Of these, approximately 20% will be for eye-related injuries. In America, the Bureau of Labor Statistics indicates that nearly one million Americans have lost some degree of sight due to an eye injury. More than 2,000 workplace eye injuries occur each day and these cost an estimated $1 billion each year. Nearly 100,000 of these injuries will be disabling, resulting in temporary or permanent loss of vision. The frequency and type of eye injury varies, depending on the activity. Not surprisingly, mechanical engineering is identified as particularly high risk for foreign body penetration injuries, but other eye-related injuries are prevalent in different industrial sectors, including service industries. Home and sports eye-related accidents also figure highly. Studies indicate that 30% of eye accidents occur at home, with many injuries occurring as a result of using tools or machinery. Sports and leisure activities account for another 16%, particularly among younger men, with racket sports being blamed for about half of these through collisions with other players and rackets and impacts with squash and tennis balls and shuttlecocks. It is considered that the vast majority of these injuries could have been prevented if appropriate protective eyewear had been worn. Typically, safety eyewear is available to provide protection against impact, chemical or molten metal splashes, dust, or radiation from welding arcs or lasers. Protective products may take the form of spectacles, goggles, visors, face shields or hoods and the most suitable should be selected for a particular application. For instance, safety spectacles are usually made with shatter-resistant plastic lenses to protect the eye from flying debris, providing impact protection against hazards commonly found in many activities. These include engineering and timber cutting where fast-moving particles are caused by operations such as drilling, grinding and cutting, and also from broken tools and damaged grinding wheels. Safety spectacles may be fitted with prescription lenses and normally incorporate sideshields. They are suitable for general workshop or laboratory use when protection against impact or occasional light chemical splash is required. The potential impact speed must be assessed before selecting the most appropriate protection. In some applications the use of goggles or a face shield may be appropriate where high-velocity impacts could potentially dislodge safety glasses. Advances in technology, particularly the development and use of polycarbonate materials, have resulted in more lightweight lenses that are both stronger and more flexible, and which not only provides better protection but also enables more modern designs to be manufactured. This is a key issue and accidents still happen because many people do not like wearing protective eyewear. Manufacturers are aware of this reluctance and have developed ‘fashionable’ designs to encourage greater use. However, although many types of plastic lenses provide good impact resistance, they are not inherently scratch resistant and coatings have been developed to prolong life. These can also be used to incorporate impact and chemical resistance and other features such as glare reduction, anti-fog capabilities or to protect against ultra-violet and infra-red radiation. Highly specialised coatings have also been developed for laser applications. These are designed to work at specific laser wavelengths, reflecting harmful laser light away from the eyes while allowing more visible light through. Eyeshields (overspecs) are similar to safety spectacles, but may be worn over ordinary prescription spectacles. They are particularly suitable for occasional use; either by industry site visitors, or by spectacle wearers, to avoid the expense of prescription safety glasses, but their optical quality is generally not good enough for prolonged use. Goggles provide total protection to the eyes, although they are heavier and less convenient than safety spectacles. They may be worn over prescription spectacles. Unvented goggles offer far better protection than safety spectacles where there is a serious danger of chemical splash. However goggles can be prone to misting up and ‘fog resistance’ is one of the most important qualities in this product category. Clearer vision can be achieved in a variety of ways. Double glazing can help, while goggles often incorporate direct or indirect ventilation to minimise condensation. Sports goggles often have large, filtered ventilation ports. High airflow can dissipate humidity that would otherwise condense as fog on the lens. The most fog-resistant modern sports goggles have large ventilation zones and larger air volumes inside the frames maximise airflow and minimise condensation. Vents must be filtered fully to keep eye-irritating particles outside the frame and away from eyes. However, directly ventilated goggles do not provide adequate protection against ingress of chemicals, gases and dust. Indirectly ventilated goggles give better protection against liquid ingress but do not prevent entry of gases or vapours. An effective anti-fog coating can also be applied to the lenses. These tend to work in one of two ways for different moisture levels. For moderate moisture situations water-absorbing (hydrophilic) lens coatings absorb water into the coating structure and evaporate moisture. For more extreme conditions, water-repellent (hydrophobic) coatings on the lens cause the water to slide off without impairing vision. A hydrophobic coating reacts to moisture by activating the treated lens surface, forming a thin, invisible film of water. As moisture continues to build, the film gets heavier until it flows over the lens surface, creating what is commonly referred to as a ‘sheeting’ effect. A disadvantage of hydrophobic coatings is that, with repeated cleaning or soaking, they can wear off and are therefore not always as durable as hydrophilic types. More recently, technological advances have meant that it is possible to combine the attributes of both methods to create a coating that is not only durable but features both hydrophilic and hydrophobic properties. A key feature in goggle performance is a sealed, comfortable fit. Goggles that are uncomfortable due to gaps, pressure points or improperly adjusted straps will not protect the eyes against blowing dust and smoke. A comfortable anatomical fit and rapid, effective strap/adjustment systems are essential. High-quality goggles use a combination of anatomical modeling and malleable face padding to provide a sealed fit that is comfortable for polonged wear. Elastic straps with convenient adjustment ensure a proper fit. Face shields protect the whole face, but do not fully enclose the eyes, so do not give protection against dusts and gases. They are comfortable to wear, not prone to misting and may be used with ordinary spectacles. Full face shields can be used to protect the whole face from splashes of liquids and these can also be selected with chin guards if there is a danger of splashes being deflected, for instance, up from a work surface. More specialist eyewear is available to reduce glare from welding and laser applications. The European Union and associated countries have some of the most comprehensive legislation regarding the performance requirements and use of personal protective equipment (PPE), and this cover all forms of safety eyewear. Safety eyewear must be assessed and CE marked before it can be supplied into the European market. It has been illegal for many years to place an item of PPE on the market in a European member state unless it carries the CE mark.. Directive 89/656/EEC - the ‘use’ directive, covers the use of PPE at work. It requires employers to provide suitable PPE to employees where a particular hazard cannot be eliminated by other means. Directive 89/686/EEC - the Personal Protective Equipment directive covers minimum health and safety performance criteria and procedures for PPE placed on the market within the European Economic area to ensure it is fit for intended purpose. It specifies in general terms what features should be addressed in the design of PPE and how it should be tested and certified. Products meeting the requirements of the PPE directive should be marked with the CE symbol. In order to CE mark safety eyewear, manufacturers must submit examples of product to a Notified Body for assessment. Notified Bodies, such as SATRA, are Europe-based organisations which have been appointed by member state governments and notified to the European Commission on the basis of their ability to carry out the examinations and tests required for CE marking of PPE. Three categories of PPE are recognised by the PPE Directive and are based on the risk, consequences and severity of injury likely to occur to someone not wearing adequate PPE. Each category requires a different level of involvement by a Notified Body. Safety eyewear is considered to be ‘category 2’ or ‘intermediate’ category PPE and as such is subject to EC type examination by a Notified Body. The Notified Body will check the technical documentation - called the technical file - which should contain information relating to the use of the product, design, materials, manufacturing methods, quality control, markings and instructions. As part of this, the Notified Body will also need to assess performance test results and assess whether the product contains any substances restricted by European legislation, such as nickel. The Notified Body will also assess documentation and supporting test reports to confirm that the appropriate physical and performance tests have been carried out and that the protection claimed for the product meets a minimum standard for the application - such as impact tests on lenses. Checks will also be made to ensure the protective coverage area is adequate and eyewear will also be checked to confirm it is sufficiently robust and durable. Products will also be assessed to confirm that they will not create any additional hazards to the wearer or anyone else coming into contact with them. This ‘innocuousness’ assessment includes a check for any parts of the product that might have sharp edges that may cause injury and an assessment of the materials to ensure that they do not contain any substances considered harmful to health and restricted or banned by European legislation. The Notified Body will also assess ergonomics to ensure the eyewear is comfortable to wear and does not have a detrimental effect on the user’s ability to see what he or she are doing. To support the PPE Directive, CEN - the European standardisation organisation - has been mandated by the European Commission to produce technical standards written specifically for safety eyewear products. These published EN standards describe in detail how a particular type of product should be tested and what performance is required to achieve a satisfactory pass. The tests developed for the various standards are designed to assess safety eyewear against the requirements of the PPE Directive for the risks of the particular activity for which they are intended to be used. The European Commission reviews standards and, if suitable, they become officially ‘harmonised’ throughout Europe, and have a ‘presumption of conformity.’ This means that products that are fully covered by and meet the standard requirements are deemed to satisfy the directive’s general safety requirements. One of the most important general eyewear standards is EN166: 2002 Personal eye protection - specifications which gives basic requirements for general safety eyewear. EN167:2002 Personal eye protection - optical tests and EN168:2002 Personal eye protection non optical test methods provide test methods for optical and non-optical properties. Other standards address more specialist applications, such as welding protection or ski goggles. However, many of the tests required are also the same basic test methods called up in EN166, EN167 and EN 168, but with different requirements relevant to specific hazards. EN166 specifies functional requirements for various types of personal eye protectors used against typical hazards found in industry, laboratories and educational establishments which are likely to impair vision or damage the eye. EN166 is also applicable to personal eye protectors fitted with prescription lenses. The standard does not cover nuclear radiation, X-rays, laser beams and low temperature infra-red radiation. Optical tests detailed in EN167 ensure that any form of protective eyewear does not unacceptably distort or restrict the wearer’s vision and includes checking for spherical, astigmatic and prismatic refractive powers. Tests need to be highly sensitive to these properties of the oculars (lens components). The laboratory equipment must be sensitive enough to detect minor distortions that an optician would not consider necessary to measure or correct. Calibration of this equipment relies on the use of special lenses specially ground for the purpose as they have longer focal lengths - they are “weaker” lenses - than any generally commercially available. Other test methods include assessment of light diffusion (two different tests depending on whether the lens is vision corrected or not) and variations in luminance transmittance. Transmittance of light is an important parameter to check and can be measured both as an average across the ocular and in localised areas. Measurements have shown that ordinary reading glasses with no protective properties may reduce the light reaching the eye by around 10% and lightly tinted reading glasses can reduce light by 40%. Protective eyewear can similarly reduce vision in low light conditions. The measuring equipment used provides a highly controlled, parallel beam of light at 5mm diameter collected by a detector specially selected to have a very low sensitivity to the invisible infra-red light which all lamps produce. The detector is calibrated for 100% transmittance with no ocular in position to compensate for any variation in lamp output as all lamps lose some of their efficiency over time. The ocular is then placed in front of the detector and the reduced light collected is immediately registered. The beam can scan the ocular to check for local variations across its area. Non-optical tests covered in EN168 include field of vision to ensure that frames do not unacceptably impede peripheral vision. This parameter is checked using laser equipment that projects beams of light onto the test sample which is mounted onto a head form. Physical property tests ensure that the eyewear provides the mechanical protection claimed and remains fit for use after normal wear and tear. A variety of properties can be tested depending on the hazards against which protection is offered. Some tests such as checking for the lateral protection provided by articles such as goggles are quite simple. The goggles are mounted on a standard head form and a 2mm. 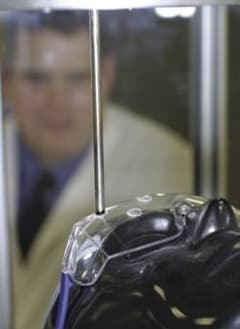 diameter probe is used to attempt to touch defined areas around the eyes. Other tests can be more complex. Most safety eyewear must be tested for resistance to ignition using a heated probe at 650oC. A steel rod is heated to the required temperature and pressed onto all parts of the test sample except elastic headbands and textile edgings. As an absolute minimum for robustness, oculars must withstand pressure from a 122mm. diameter steel ball loaded with 100N (approximately 10kg) without breakage or excessive deflection. Where increased robustness is needed, the steel ball is projected to impact the defined points on the frame and oculars under high and low temperature conditions. Corrosion resistance tests involve immersing the sample in a solution of sodium chloride (salt) at both boiling point and room temperature. The sample is then dried off and checked visually 24 hours later for any signs of corrosion. Other tests include assessing the usability of the eye protector after exposure to high temperature, low temperature and ultra- violet light originating from strong sunlight or welding arcs. More specialist eyewear has been developed to filter out excessive light from, for instance, welding arcs. Other applications include laser protection. Laser goggles conforming to EN207 and EN 208 work by dissipating laser energy, blocking off a narrow range of wavelengths, so allowing the user some degree of visibility. Laser safety glasses should not only absorb laser light of a given wavelength, but should also be able to withstand a direct hit from the laser without breaking or melting and withstand the effects of a continuous wave laser for 10 seconds or 100 pulses for a pulsed laser. Regardless of the type of product, safety eyewear should be ‘personal issue.’ Eye size, bridge size and temple length all vary and wearers should ensure that the product fits properly and is comfortable. Safety glasses should fit comfortably over the ears, with the frame as close to the face as possible and adequately supported by the bridge of the nose. It is important to look after and maintain safety eyewear. Dirty lenses impair vision, causing eye fatigue which can lead to accidents. Safety glasses should be cleaned regularly, following the manufacturer’s instructions. Lenses should be treated carefully to avoid scratching - which not only impairs vision but can weaken lenses. Damaged or badly fitting eyewear should be replaced, this being particularly important for scratched lenses or face shields if they become crazed or brittle with age. European legislation and standards place obligations on employers and manufacturers to provide safety eyewear that is fit for purpose and provides adequate protection against a variety of hazards. While eye injuries still form a high percentage of accidents both at work and home, many are easily preventable by wearing appropriate eye protection. Advances in eyewear technology have enabled the development of more protective, better designed and more comfortable products, which should lead to a reduction in injury statistics.